The types of social protest in China are determined by the country’s special pattern of economic development. Economic growth in China depends on real estate and the resources sector—petroleum, heavy chemical industry, and mining. Social protests thus concentrate on these sectors. The first major type of protest is land rights defense. This includes housing demolition and eviction in cities and land requisition in the countryside. The second major type involves environmental rights defense, because pollution caused by the resources sector such as the heavy chemical industry seriously endangers the wellbeing of the people. And, the third type involves corruption among local government officials. Many corruption cases have to do with local officials embezzling land requisition compensation funds. China’s public security expenditures (commonly known as “stability maintenance expenses”) directly correspond to the growth of social protests. As the number of protests increased dramatically in 2009, the focus of local governments underwent subtle changes. The principle of “development is the priority task” became “development is the priority task and stability maintenance the foremost responsibility.” Government agencies in charge of stability maintenance were given permanent status. There are stability maintenance offices all the way from the central to local governments. The Central Committee of the Communist Party of China established a “Central Government Leading Group for Stability Maintenance.” It administers the Central Government Office of Stability Maintenance, located inside the Central Political and Legislative Affairs Committee. This office, under the direct administration of the CPC Central Committee, is responsible for rules of procedure and coordination. A “stability maintenance” office (full name: “office of the leading group for stability maintenance work”) can be found at every level of government—from each province or autonomous region to every city, county, village, neighborhood, even in major civic institutions and business enterprises. To illustrate how alarmingly high stability maintenance costs are, researchers often compare them to military expenditures. The 514 billion yuan [~$82.52 billion] spent on stability maintenance in 2009 was close to the 532.1 billion yuan [~$85.43 billion] in military expenditures that year. The 624.421 billion yuan [~$100.25 billion] for stability maintenance in 2011 surpassed the military budget of 601.1 billion yuan [~$96.51 billion] the same year. Public security expenditures chiefly fund organs of state-sanctioned violence. Of the 624.421 billion yuan [~$100.25 billion] public security budget in 2011, the budget for the following five groups account for 506.4 billion yuan [~$81.30 billion], or 81 percent, of the total public security budget: the armed police, public security, courts, judicial administration system,9 and anti-smuggling police. Of this total, the portion for public security departments (including state security, and public security for railway and civil aviation) was more than 322.562 billion yuan [~$51.79 billion]. 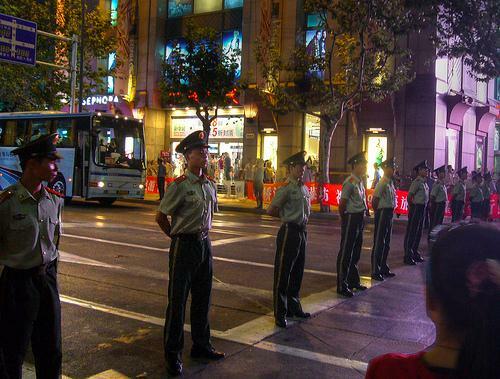 The second-largest portion was 104.6 billion yuan [~$16.79 billion] for the paramilitary police. The budget for the courts—responsible for resolving social disputes—was no more than 60.804 billion yuan [~$9.76 billion], only 9.7 percent of the total.10 It must be pointed out that, unlike in countries with separation of power—where the courts are independent of the executive and legislative branches of the government—the court system in China is controlled by the CPC and is considered part of the stability maintenance system. According to statistics provided by the article “Public Security Bill,” in the May 2011 issue of Caijing Magazine, the public security expenditures of local governments surpassed those of the central government. The amounts were 521.968 billion yuan [~$83.80 billion] and 102.452 billion yuan [~$16.45 billion], respectively, representing a ratio of greater than 3:1.19 This shows that local governments are the prime actors of stability maintenance. We can see from this that local governments are the real culprits in the disputes and protests caused by land acquisition and industrial pollution. But since the local government has the executive power and judicial administrative power, they can use violent means to suppress people at any time. A great number of cases demonstrate that those whose interests have been harmed tried to get justice through legal channels. But either their cases are not accepted by the local courts or they lose their cases after exhausting their energy and money. If the people protest, they will most likely be violently suppressed by police dispatched by local authorities. They may even be arrested and labeled protest leaders and end up in prison. When we see the logic of the relationship of the above facts, things are terrifyingly simple: China’s local governments at different levels are themselves creators of social conflict, and they are the biggest threat to public security. He Qinglian (何清涟), is an economist and author of China’s Pitfall and Media Control in China. A graduate of Hunan Normal University, with a master’s degree in economics from Shanghai’s Fudan University, He Qinglian worked in the propaganda department of the municipal Communist Party Committee in Shenzhen before becoming a writer and editor for the Shenzhen Legal Daily and working at Jinan University. He Qinglian moved to the United States in 2001.